Those who waste an entire Saturday armed with a squeegee and a bucket, and those who hope the rain is doing the job. At Castle Cleaning, we know you have better things to do than spend your time cleaning your windows only to end up with streaks anyway. This is why we tailor our residential window cleaning services to match your schedule while providing a streak-free shine with professional-quality products. Hand Detailing: Unlike other companies, we detail your whole window. This includes window ledges, dividers and frames along with glass panes. Eco-Friendly Cleaning Products: Our premium products not only get your windows clean, they do it while being safer for you and the environment. Our window cleaners also conserve water whenever possible. Insured Window Cleaners: Gold Standard carries comprehensive insurance to protect you, your property and our window cleaners. We take all precautions to ensure no damage comes to your property, but when the accidents happen, you’re covered. Convenient Scheduling: Our residential window cleaning services are available around your schedule! We can even clean when you’re not home. Guaranteed Satisfaction: All of our work is backed with a 100% satisfaction guarantee! 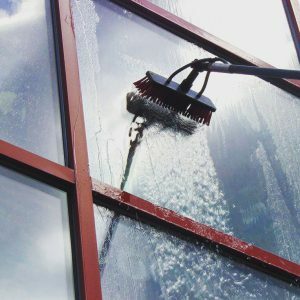 When Should Windows Be Cleaned? How Often: As little as two times a year can be enough for many homes. For most windows, this is enough to make your home appear cleaner and brighter inside and out. 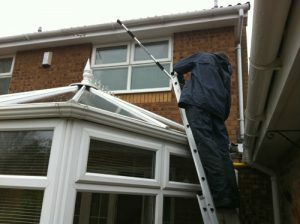 When: The beginning of spring and the beginning of Autumn are the best times to get your windows cleaned. This helps get rid of the dirt and streaks that build up over winter and summer. Other Considerations: Homes near a body of salt water may find they need more frequent cleaning due to the salt content in the air. Similarly, a busy road nearby may also result in more dirt on your windows. Leaving dirt or salt on your windows can cause damage along with giving an unkempt appearance, making cleaning even more important.